Being home décor fanatics, we explore every entity that can make a difference to the overall decor. 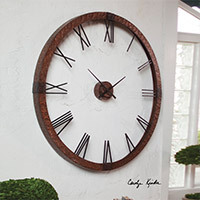 This includes artistically created clocks, especially those with a vintage or classic appeal. 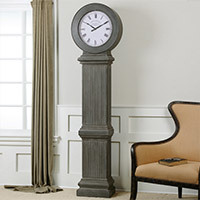 This includes grandfather clocks that are also referred to as Longcase Clocks. These are true vintage items, and make a lot of aesthetic sense when placed on the fireplace mantel. These are big clocks, which can easily become the point of visual engagement in your living room. Longcase canes have an old world charm, complete with striking bells and ringing chimes. We also have antique clocks on offer—Mantel Clocks. Also called, Shelf Clocks, these clocks were famous during the 18th century, some with huge glass domes. 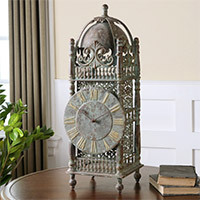 Now, you can bring the aura of 17th - 18th clocks with the Chouteau Floor Clock in a beautiful antiqued finish. Available in limited numbers, these clocks have an increasing demand, even among dedicated clock collectors and those who adore things with a vintage appeal.